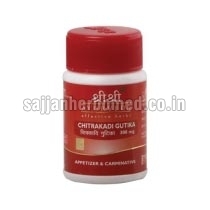 We have in our store Chitrakadi Gutika Tablets that are indicated for treating indigestion. Chitrakadi Gutika Tablets are prepared using natural herbs and other ingredients with utmost care. These tablets also help in improving appetite and absorption of food. They treat Grahani (Malabsorption syndrome) and sets right digestive impairment. Chitrakadi Gutika Tablets are carminative. They are known for high efficacy and long shelf life. Further, these tablets are available in a pack of 60 tablets.